Nestled in the heart of Downtown Cape Coral, Florida, BackStreets is “Where the locals go…”, and for good reason. This local sports bar serves up great bar food, tasty drinks, bar sports, live music and karaoke – seven nights a week! Confession: This place was my bar long before I took it on as a client. With an immense focus on customer service, it makes sense that so many snowbirds also flock here during the winter months. While BackStreets had a good following on Facebook, its website and other social media accounts saw little action. A new site and more focus on online marketing has resulted in a steady growth of traffic and engagement. It will take the better part of a year, though, to see definitive results. This is common with brick-and-mortar establishments that also rely on seasonal foot traffic. A new, mobile responsive website. It boasts a simple design, yet is tailored to what customers want… instant access to daily specials, the music calendar, upcoming events and sports. A VIP program that provides a popular, free item (a drink, a meal, a special gift) every month. A now definitive email marketing plan (via Constant Contact) that utilizes specific interest lists to notify customers of bar happenings. Open rates are more than 20% above industry average for its class. Social profiles that are active and provide real responses to existing and potential customers. More media content, including video and photo galleries. What separates BackStreets from many is the fact that I have direct communication with the owner, the managers and the staff. Everyone is approachable and works together to ensure the best service. That means what people see online is what they can expect to experience when visiting the bar in person. 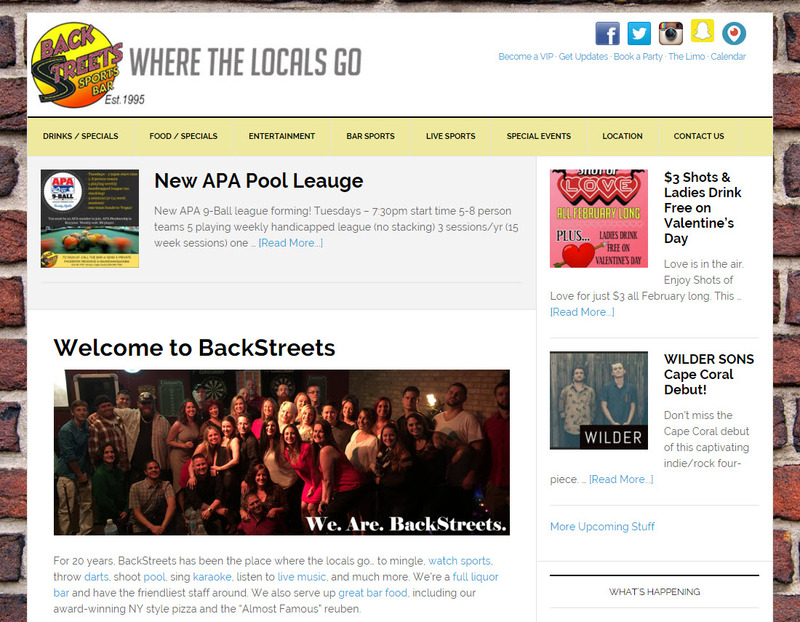 BackStreets.com runs on WordPress and the Genesis platform.